In March 2017, SMU’s Central University Libraries uploaded 421 items into CUL Digital Collections. 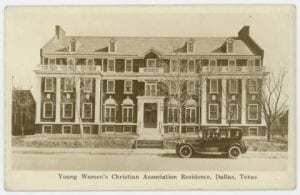 Young Women’s Christian Association Residence, Dallas, Texas, ca. 1921, DeGolyer Library, SMU. 102 items from the George W. Cook Dallas/Texas Image Collection as part of the TexTreasures FY2017 grant program, sponsored by the Texas State Library and Archives Commission and funded by the Institute of Museum and Library Services. This month’s uploads include 48 real photographic postcards of Dallas buildings, including the Medical Arts Building, Adolphus Hotel, Magnolia Building, and Oriental Hotel, and a set of views of different rooms in the Young Women’s Christian Association building, ca. 1921. Balinese Room, Galveston, Texas, ca. 1942-1970s, DeGolyer Library, SMU. Also included are 54 matchbook covers for politicians, nightclubs, restaurants, hotels, and other businesses around the state of Texas; three WFAA news personalities from the 1960s-1970s; and adult entertainment businesses. Of special interest is the matchbook cover for Balinese Room, Galveston, Texas, a famous nightclub and illegal casino built on a Galveston pier extending 600 feet into the Gulf of Mexico, renowned in the 1940s and 1950s when it highlighted celebrities such as Frank Sinatra, Bob Hope, George Burns, and the Marx Brothers. ZZ Top wrote and released a song about the nightspot titled “Balinese.” The nightclub was listed on the National Register of Historic Places in 1997. It reopened in 2001 without the gambling, but was destroyed by Hurricane Ike in 2008. 2 salt-print portrait photographs from the Collection of Civil War and Military Cartes de Visite and Portraits. One print, from 1862, features Sarah Gilbert Bloss, and the other is of John Bloss. 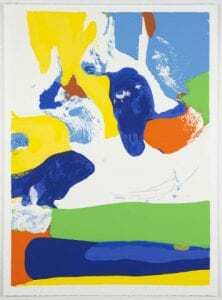 Concord, 1975, by James Brooks, Bywaters Special Collections, SMU. 24 paintings, silkscreens, and lithographs were added to Texas Artists – Paintings, Sculpture, and Works on Paper. These artworks, created by James Brooks between 1931 and 1985, were a gift of the James and Charlotte Brooks Foundation in memory of Mary Nell Brooks Nichols. Highlights include an oil painting portrait of his first wife, Mary MacDonald, and several abstract pieces. 2 panoramic photographs, ca. 1910, from the Giesecke Family Collection of Photographs and Panoramas of Mexico showing a Centennial celebration review of troops in Mexico City and a view of the Chapultepec Castle. 28 stereographs by Abel Briquet, ca. 1875, from the Elmer and Diane Powell Collection on Mexico and the Mexican Revolution featuring works of art, monuments, bridges, buildings, and natural features in Mexico City and several other locations in Mexico. Included in these images are a number of famous pieces of Aztec and Mayan art, including the Antiguedades Aztecas Calendario, an iconic Aztec basalt stone carving, also known as the Sun Stone, and a Mayan Chac Mool statue. [WFAA News Clips and B-roll, ca. December 1, 1971], G. William Jones Film and Video Collection, SMU. 24 videos from WFAA Newsfilm, 1960-1978. The videos contain news clips and a- and b-roll footage from the Dallas ABC Television station covering December 1971. People were identified and a written summary was added to the December 1, 1971 video. Highlights from this video include a murder investigation, a bank robbery, the release of a girl from the Children of God cult, firefighters voting, a Dallas Chaparral basketball game, teenage beauty contestants, and the possible appointment of an African American man to a board position. 26 stereographs from the W. Henry Brown New Mexico Stereographs. Santa Fe locations include the Palace Hotel, Old San Miguel Church, city plaza, and several views of historic adobe structures, including the oldest known house in Santa Fe. Cities depicted include the San Juan Pueblo, Albuquerque, Mesilla, the Taos Pueblo, and the Tesuque Pueblo. Other images show Starvation Peak, Apache Canyon, the vicinity of the Cochiti Pueblo, and the abandoned pueblo structures of Pecos, New Mexico. 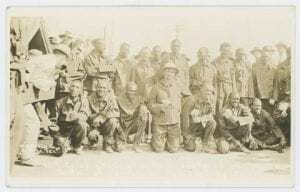 10th Cavalrymen who were captured at the Battle of Carrizal, 1916, by Walter Horne, DeGolyer Library, SMU. 7 real photographic postcards from American border troops and the Mexican Revolution taken by Cruse and Shaw, Walter H. Horne, C.C. Harris, and other unknown photographers. The images show buildings in Juarez with damage from gunfire, sailors aboard the U.S.S. New Jersey in Tampico and Veracruz alongside Mexican refugees and the ship’s band, a group of scouts positioned on a rail cart, a hilltop view of Camp Cotton in El Paso, and the 10th U.S. Cavalry’s Buffalo Soldiers posing with handfuls of flowers after being delivered to El Paso, having been captured in Mexico during the 1916 battle of Carrizal. [Ronald Reagan and George Bush Inaugural Sleeve Button], 1981, DeGolyer Library, SMU. 14 medals and buttons from the Hervey A. Priddy Collection of American Presidential and Political Memorabilia, 1832-ongoing, consisting primarily of inaugural medals from Gerald Ford through Donald J. Trump. Of special interest is the Ronald Reagan and George Bush Inaugural Sleeve Button and the Ronald Reagan and George Bush Inaugural Jacket Button, which are part of a set of seven coat buttons (four smaller sleeve buttons and three larger jacket buttons). The design for all seven buttons is identical. The Daily Campus, Volume 56, Number 5, September 4, 1970, SMU Archives. 1970: 54 issues of The Daily Campus and The Summer Campus feature Southern Methodist University’s student journalists reporting on George H. Bush’s senatorial campaign and visit to the campus, where he spoke to students and was pelted with marshmallows. Student reporters also covered President Richard Nixon’s talk at the Market Hall Convention Center in Dallas, where the SMU band was present. Other topics covered include the ongoing Vietnam War, the Dawson Field hijackings of four passenger jets, the bombing of the Harvard University library, and issue of integration facing SMU and the Dallas area. In 1970, student journalists produced a three-part series on SMU’s efforts toward integrating the campus. 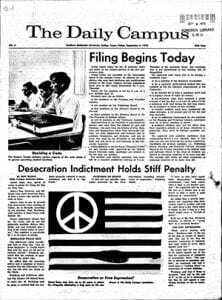 1972: 115 issues of The Daily Campus and The Summer Campus feature Southern Methodist University’s student journalists’ continued reporting on the Vietnam War, Richard Nixon’s re-election and visit to China, and the beginning of the Watergate scandal. Other prominent topics include women’s rights, integration, the anti-war movement, and President Nixon’s drug policies. This entry was posted in Civil War, Dallas, Early Texas Postcards, Mexican Revolution, Mexico photography, SMU history, SMU Student Newspapers, Texas artists, Texas photographs, TexTreasures2017, U.S. West, Uncategorized, Video, WFAA video. Bookmark the permalink.